United Nations Ambassador Nikki Haley’s abrupt resignation on Tuesday came one day after an ethics group requested the State Department’s inspector general investigate her acceptance of seven free flights aboard private jets. 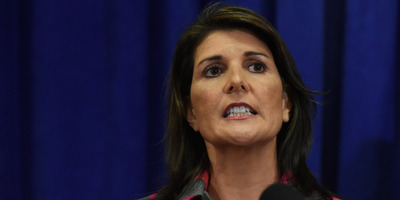 United Nations Ambassador Nikki Haley’s abrupt resignation on Tuesday came one day after an ethics watchdog group requested the State Department’s inspector general investigate her acceptance of seven free flights aboard private jets from a trio of South Carolina businessmen. But the group, Citizens for Responsibility and Ethics in Washington, said in its complaint that Haley’s financial disclosure did not provide enough information to make the assertion that the flights between New York, Washington, DC, and three South Carolina cities qualified for the exemption. Johnson is chair of The Original Six Foundation, which Haley founded in 2011. McKissick is chairman of Clemson University’s board of trustees. Haley is a graduate of the university and her daughter is currently enrolled there as a student. “By accepting gifts of luxury private flights, Ambassador Haley seems to be falling in line with other Trump administration officials who are reaping personal benefits from their public positions,” CREW’s executive director, Noah Bookbinder, said in a Monday statement. Walter Shaub, the former director of the Office of Government Ethics, noted on Twitter on Tuesday that Haley’s resignation came after CREW filed its complaint. Haley’s resignation caught Washington, DC, and the diplomatic community by surprise. She announced her departure less than a month after the United Nations General Assembly in New York. Haley was one of the foreign-policy and Washington establishments’ favourite Trump administration leaders. Some had even speculated that she would soon run for president. “It has been an honour of a lifetime,” Haley said of serving as UN ambassador.